This curly mess is a new shawl/cowl that I’ve been working on instead of reworking the Raspberry shawl. It’s called Verdu and is worked in the round with my last skein of the now discontinued semi-solid Daidem yarn from Knit Picks. I was imagining a sort of stretchy, deep cowl that I could pull round my shoulder like a shawl, but even before I cast on, I realized I only had enough yarn to make a cowl. No problem, I thought, maybe it would still make a skinny thing to go around my neck and I can test the pattern for a deeper one later. Plus, as I started in I got the stripes I was so surprised about last time I used this yarn. It looks just mottled on the skein and in a ball, but when you start to knit, distinct lines of color show up. The first few color changes were at ideal points, the next few, not so much. I noticed the bottom edge was curling as I knit up, but things got quite shocking when I cast off, as you can see. I couldn’t even put the thing around my shoulders because the curl was so pronounced. This is a logical conclusion, and, in fact, garment edge itself will not curl up. However, that does not mean that the GARMENT will not curl up. As disappointed knitters in knitting forums all over the internet can testify, the most likely result of a garter stitch band on a stockinette stitch garment is that the bands either flip up, or the whole garment continues to curl, taking the “non curling edge” right along with it. Moral: The more I learn, the more I need to learn. Updated: Aggressive blocking does seem to minimize the curl but I think it will return while wearing. 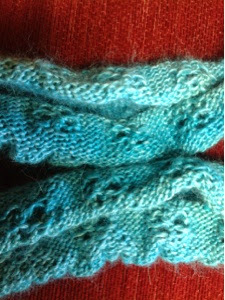 Another possible fix is adding garter stitch ridges before and after the ripple sections in the design itself. I’ve been using a program to make charts on my iPad using an app that is no longer available, so even though it’s still on my iPad, I’ve been looking at other options for how to make knitting charts. I work primarily with an iPad and with a Chromebook, so Windows software for charting isn’t really an option and neither is a graphics program like Illustrator. 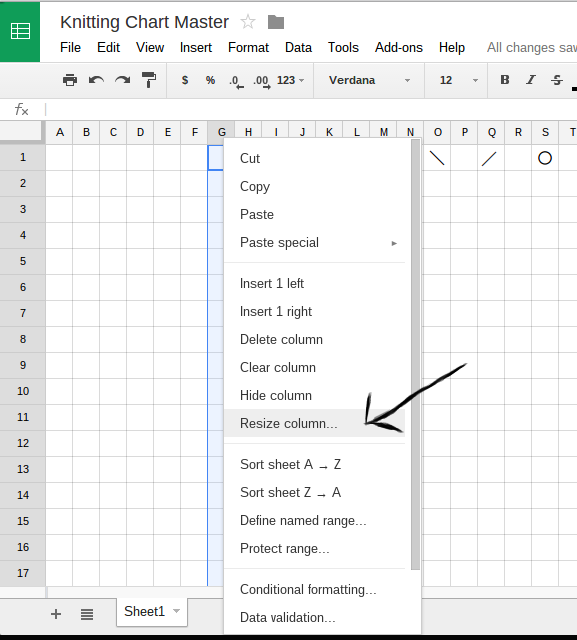 I came across some articles like this one about how to use Excel to make charts. Well, I don’t have Excel either, but I do have Google Sheets. 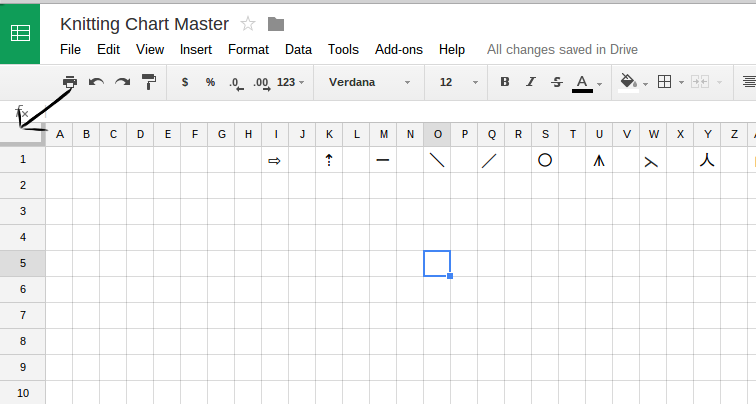 The first step was making the grid in Google Sheets into even squares. It turns out if you click on the box in the upper left hand corner you can manipulate the size of all the rows or columns at once. However, you are just doing it by eye. There was no way I found to specify how to change all the rows to a specific size at the same time. So after adjusting back and forth a bit, I would back out and select one row or column and check how many pixels wide or tall it was by two finger tapping on the column and then picking the “Resize column (or row)…” option on the menu that pops up. That would tell me the current size of the column or row and then I would go back and adjust until they were the same pixel height and width. With everything still selected, I went to “Format– Align” and made sure the alignment was centered left to right and top to bottom. 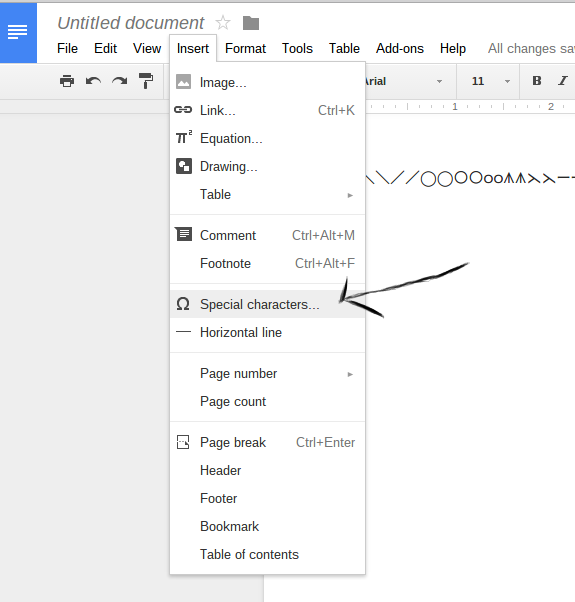 Next problem, no special symbols menu in Google Sheets. 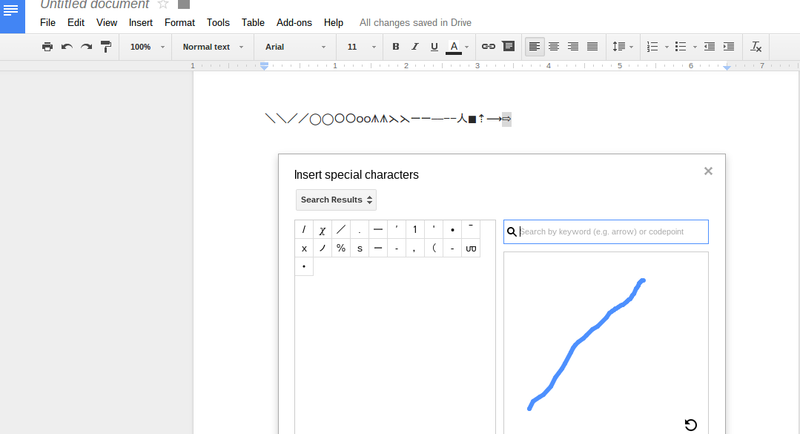 I opened a regular Google Document and went to “Insert– Special Characters…” and picked symbols for the common stitches I use in charts. 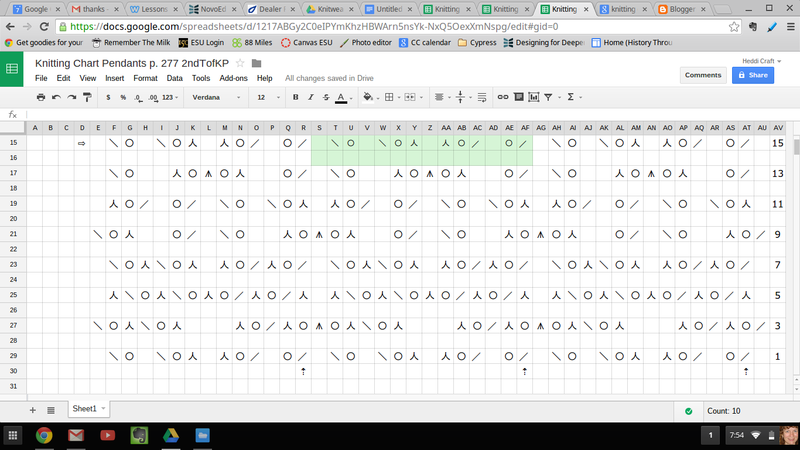 I copied and pasted those in a row across the top of my grid paper spreadsheet. I can copy and paste them onto the squares as needed. Here is a copy of what I did that you can use to get started. Just click on the link and the sheet will open up. You can make a copy to edit it. So now I can more quickly make charts from written patterns because in a spreadsheet I can copy and paste repeats and rows and motifs. You can see an example below. This is a chart of the Pendants pattern from the Second Treasury of Knitting Patterns by Barbara Walker. You can see the little arrows I used to mark the beginning of the repeats. The charts could be transferred to a pattern by taking a screenshot and editing in a web based program like Pixlr.